FINAL SPACING: 20 to 30 feet although I don’t recommend planting. NATURAL HABITAT AND PREFERRED SITE: Eastern third of Texas in a variety of soils. IDENTIFICATION INFORMATION: Honey locust is an upright, spreading, lacy-textured shade tree that has huge thorns on the limbs with clusters on the trunks. Large brown beans in the fall or winter. FLOWERS AND FRUIT: Flowers are green racemes in May through June. They are not showy. Fruit ripens from September to October. Legumes of the bean pods are 1/2 to 1-1/2 feet long and 1/2 to 1-1/2 inches wide. BARK: Grayish brown to black on the older trees. Fissures are narrow and get deeper with age separating into scaly ridges. FOLIAGE: Leaves are alternate, compound, deciduous, with yellow fall color. They have an overall lacy look. Leaflets are small. CULTURE: Honey locust grows pretty much in any soil, is drought tolerant, tough, but not recommended due to the incredibly large and vicious thorns. PROBLEMS: Big nasty thorns, borers, and root diseases. 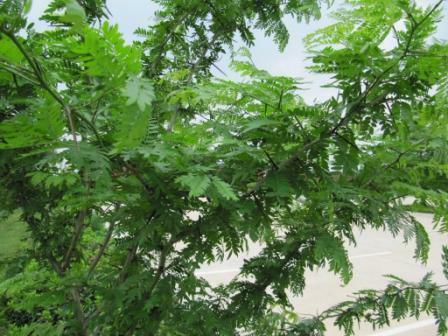 Honey locust tends to throw off limbs when in stress, especially during drought in the summer. PROPAGATION: If you really want to, you can grow honey locust from the seeds. Pods should be gathered from the ground or picked when brown and dry and planted in the fall or kept at about 41 degrees over the winter and planted in the spring. INSIGHT: If decent specimens are growing on your property, it is okay to keep them unless the thorns present a serious problem. I do not recommend planting new ones. Thornless hybrids do exist but they don’t seem nearly as healthy. Pods are eaten by cattle, deer and other wildlife.